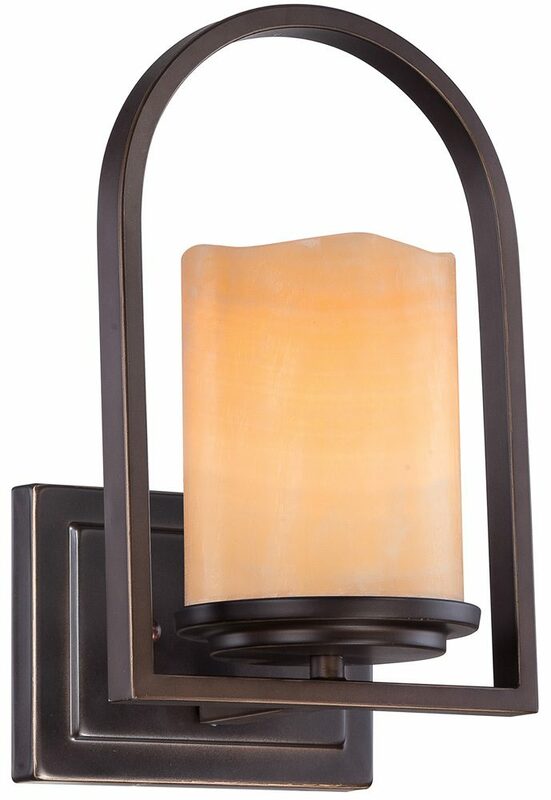 The Quoizel Aldora palladian bronze 1 lamp wall light with yellow onyx shade features a rustic contemporary look, wrought iron frame and yellow onyx stone shade that gives a romantic glow. A feature wall light, with a rectangular wall bracket and arched frame finished in palladian bronze. The frame surrounds the upward facing lamp fitted with a yellow onyx stone shade. The shade is made to resemble a candle and will give the most wonderful glow. The Aldora collection evokes a feeling of warmth and sophistication. The yellow onyx stone shades are cut to resemble candles and complement the palladian bronze finish on the open-structured cage beautifully. It is sure to become the centerpiece of your home décor. A contemporary, rustic chic wall lamp that certainly has the wow factor. The Aldora palladian bronze 1 lamp wall light with yellow onyx shade, designed by Quoizel, founded in 1930 in New York. They relocated to Charleston in 1996 where they remain to this day. They remain a privately held, family-owned and operated business. Quoizel products are now being introduced to the UK market and have quickly built a reputation for their diverse, unique and fresh designs.